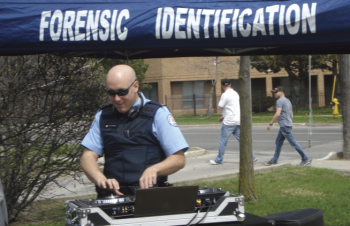 At 40 Norfinch drive, Saturday May 10 marked the 16th annual 31 Division Police Open House, commemorating the beginning of Police Week in Toronto. The theme for Police Week this year is, “Building Partnerships for a Safer Community”. This informative, yet welcoming event targets the youth in the community, in order to educate and express a sense of approachability – and most importantly generate trust. Many aspects of the Law Enforcement team were showcased, including Court services, the Police Dog service, as well as Paramedics. The Police force were willing and prepared to talk to everyone in attendance, in an effort to inform residents about the services that they offer to the community. The doors that are usually locked at the back of a Court Service vehicle, or an Ambulance were open for the youth to catch a glimpse of. In addition to the service vehicles, residents were also able to see the evolution of the traditional police car over the years. As the Dj Mike continued to blast music for the open house, children received balloons from a clown, did some crafts or got their face painted. Children also had a photo opportunity with Elmer the Safety Elephant who emphasized again the message of being safe within the community. Children were also very fond of jumping in the inflated bouncy fire truck. On top of all the activities and information offered, all residents in attendance also received a free hot dog and glass of juice. As residents entered the building, they were welcomed by photographs and more information about community services. Sharon Joseph was one of the people who proudly sat behind the Breakaway Relief Foundation stall. She was there to let the residents know about the family counseling, career development and student placement services that the employment and social services foundation offers. 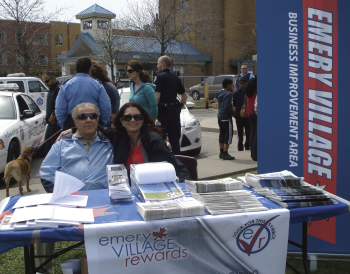 Sandra Farina ,Executive Director of the Emery Village BIA was on hand again this year to help celebrate the festivities . Thanks go out to the BIA for their sponsorship of the event . Going around to the back of the building there were information booths set up by MADD in their ongoing effort to end impaired driving. The organization created a device, where a person had to guide a metal rod through a maze without touching the edge. At first it was easy, then the person had to go through the same maze after placing goggles on their eyes; these goggles obscured their vision making it more difficult to go through the maze. This was done to express the risks and difficulty of driving after drinking. In full uniform Susan Thorning, a police officer for the past 23 years looks over the event. She explains to me that the open house is the effort of the Toronto Law enforcement team to highlight their approachability and let the community know that they are there for assistance.